Throughout the month of January, Eco Action focused on the environmental and social impact that an increasing demand for cheap clothing items made by the global north ultimately has on the global south. Our consumer purchasing power is significantly influenced and dictated by multinational corporations. This growing demand for cheap goods has tremendously increased the social and environmental risks in the regions where these items are manufactured. The stories of garment factories collapsing and killing hundreds of people in such places as Banglasdesh are typically dismissed by everyday consumers, however, our contribution to the growing demand for disposable materials and an affluent culture is directly impacting the livelihoods of those connected to the creation of our products. 4.) Educate yourself as a consumer and share with others in an open and respectful way! Eco Action thoroughly enjoyed learning about the global environmental and social impacts of the entire fashion industry’s supply chain and look forward to working with USAS and SWAPS in the future. 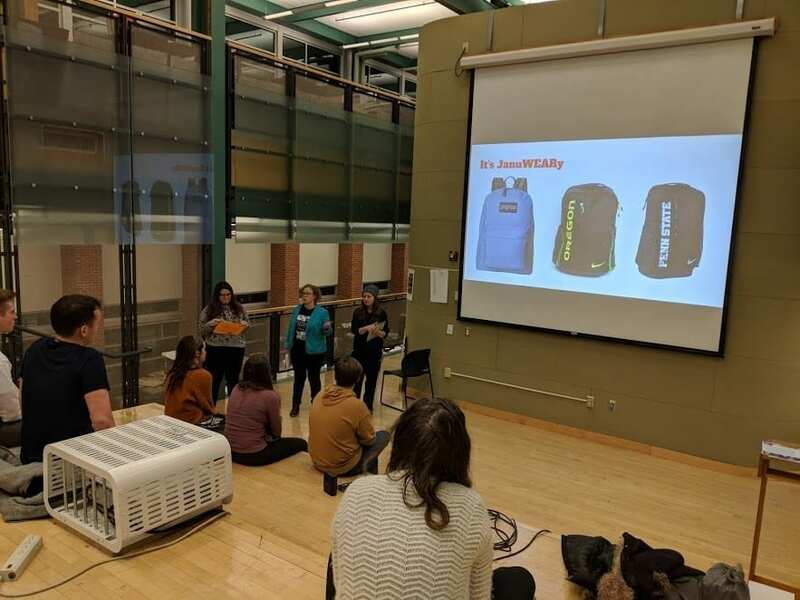 To complete the month, Eco Action held a social in the Willard Building to watch The True Cost, a documentary that showcased various garment workers’ realities across the world. We also made bags out of t-shirts as designed by our social chair, Bryn Wambaugh. JanuWEARy had a tremendous amount of lessons in store and was a extremely eye-opening experience for members. Next month, we will focus on pollution and education through our FebruAIRy series. Previous post: What’s Scarier than Halloween? Climate Change!